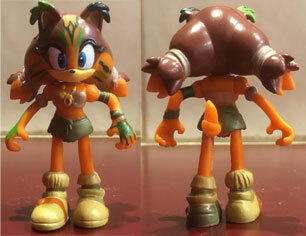 This page continues the Sonic Boom style action figures. This will inclued all the figure sizes & also any vehicles, playsets or any accessories the figures might come with. This page should be 2016 and later releases. Here are all the Boom figures together! They look good and colorful as a group. 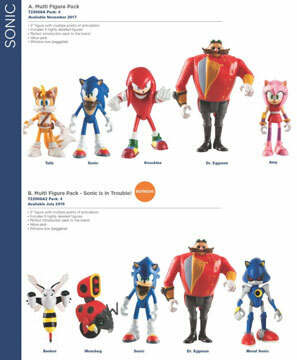 You can also see that Tomy paid attention to the scale, as Tails is shorter & Amy is not exactly the size of Sonic. The movement may be limited, but they're nice looking as a collection when grouped together on a shelf like this. 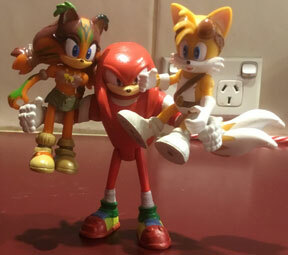 Photo by SonicRanger! 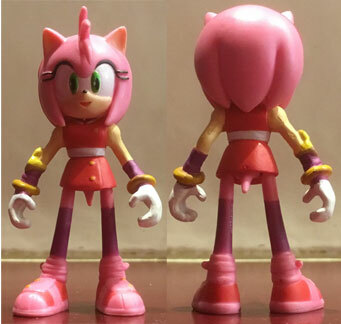 This is a Vinyl figure. They're actually called "Vinyl Figures" rather than naming them by the size as was usually done. 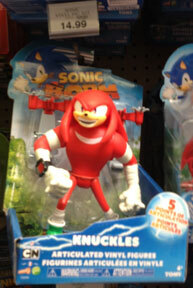 (It seems odd to not have a line name, but) Anyway, here's Boom Knuckles mint in his cardboard...tray? The "5" down there is boasting "5 points of articulation", which, for a figure of this size isn't actually a whole lot. Plus, with his spikes the way they are, his head, while articulated, will never move much. His expression is kind of strange as well, he doesn't particularly look that normal or cool with his mouth open like that. 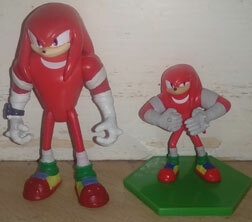 Here's Tomy's Buildable Knuckles all assembled, so you can compare it to their regular 3 inch size figure. As you can see, he's pre posed to the 'fist catch' kind of CG stock pose, and he has the facial expression from it too. (So he looks a little livelier than the standard figure) The bandages are nicely sculpted, but he's missing his power band bracelet thing. The metal plates for his shoes are also blue instead of gray. A new 2-pack for 2018! 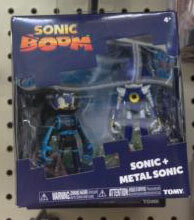 Here's a suit Sonic & Metal Sonic boom figures 2 pack. Sonic is 'dressed' (painted) in a black & blue space suit looking outfit, so you're getting a different figure and not having to buy a duplicate of every other Sonic figure they've done. Metal Sonic is the normal appearing one just like in the Boom show. This is called the "Parallel Universe Villain" pack. It has Orbot & Cubot from earlier releases, plus Eggman but with a re-paint so that now he's wearing green like the 'parallel universe' episode where everything (I guess) was slightly different. To make this not just another standard re-release, metallic paint is used on all the figures. It's always a nice touch on robot characters, and these are no exception. 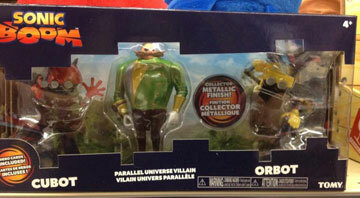 This pack will likely be the only way to get this re-colored eggman. Photo by Taaron. This Tomy 2018 catalog page is all about 2-Packs. This showcases their upcoming double-pack figures with some show related...outfits? Recolors? 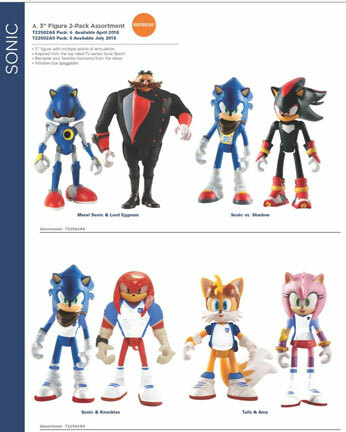 The first set is Metal Sonic & "Alternative Eggman" where he gets a costume re-color to black/red/gray with the majority in black. (He's only described there as 'alternate' so it must be an episode) Then there's regular Sonic & boom-style Shadow. 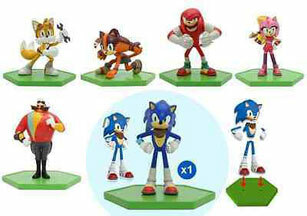 On the bottom are clearly sports playing themed figures with pairs for Sonic & Knuckles and Amy with Tails. Notice how their hands are both always shaped to grasp something in this set, will they have some kind of accessory to make the sports jersey & sports shoes make sense? Why does no one have any sports shorts except Amy? What episode was this from? 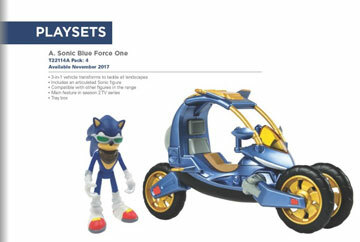 This is the "Sonic Blue Force One" vechile & figure combo pack. The Blue Force One is supposed to have 3 modes that it can transform into, to go on 'different terrains'. The only thing different about the Sonic figure that comes with it seems to be that he has some glasses as an accessory. What's the curious part? Look at the date...it says it should have released in 2017, but as far as any data shows here at Gear, no one's ever seen the item anywhere...and the book it appeared in only showed up in 2018 so what's going on with this? These 2 sets are called "Figure Diorama Packs" & each one has 3 figures. But what about the 'diorama' word? Does that mean they come with some kind of scene-setting background you can keep? Are there accessories or something that sets the scene for the figures you get? Remember the definition of the word "Diorama" & it is not "multi-pack"....so why call them this? Only finding these in the box will reveal the answer. 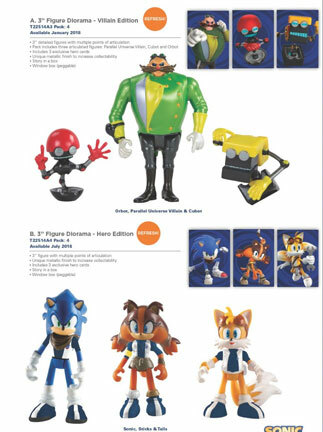 The first set is "Villain Edition" that has yet another 'alternate version' Eggman, but now his shirt is green/yellow/white instead of the red/gray/black. Orbot & Cubot though are the same as they ever were. 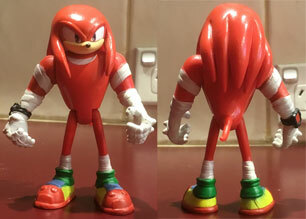 Fan photos for Boom Knuckles reveal the sports tape details on the front & back. 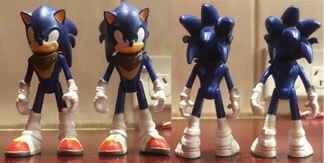 The back view reveals that they have fused all of his head spikes, and that his head will have no chance of turning, even a little bit with this design choice. 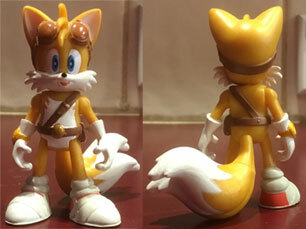 This is the 'normal' Tails Boom figure.